Are you looking for home removals Reigate? Funnells Removals are home removals Reigate specialists with many years experience in the careful relocation of peoples personal belongings with our fully trained, uniformed and experienced staff. We are experienced and fully trained to move pianos of all types, grandfather clocks, barometers and antique furniture. Whatever you need moving we can handle it, so call us now for a free home removals Reigate quotation. Come to Funnell’s Removals and take the worry out of the big day. 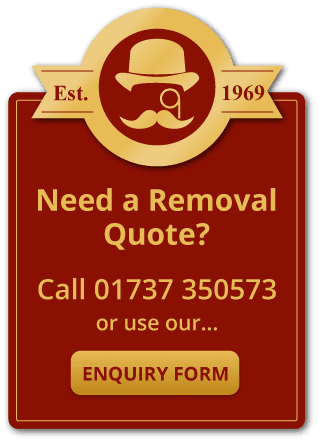 We are a family run home removals Reigate company with over 45 years of experience and have developed a clear philosophy about customer care and service. We combine our professionalism with a friendly, easy approach which is rarely found anywhere today. Home removals Reigate and throughout Britain and Europe. Reigate is a historic market town nestled at the foot of the North Downs in Surrey, within the London commuter belt. It is steeped in history with settlements dating back 2000 years. It appears in the Doomsday book in 1086 as Cherchefelle which appears to mean the open space by the hill. There are Neolithic flint mines on the ridge of the North Downs above Reigate. The Bronze Age barrows on Reigate Heath indicate there was an ancient settlement here and a Bronze Age spear head was recovered from Priory Park. There is also the remains and grounds of a castle that dates back to the 12th century and was ordered to be built by the de Warrenne family who where granted the land around Reigate by William I and it is believed that the name Reigate is derived from Roe-Deer Gate as the Town was situated near to the entrance to the de Warrenne’s deer park. The town developed a large trade in oatmeal during the 16th century and due to this the town had many animal and water powered windmills, two of which still stand today. Reigate is also the setting for the Sherlock Holmes short story The Adventures of the Reigate Squire one of the stories in The Memoirs of Sherlock Holmes written by Sir Arthur Conan Doyle. Modern Reigate is full of all the modern conveniences with two super markets and many other shops, bars and restaurants and eateries and its own celebrity chef Tony Tobin, meaning you will not go hungry. Reigate also has a very popular park which people travel to from outside of Reigate to visit called Priory Park which has a massive enclosed play area for children as well as football fields, tennis courts, a skate park, a huge wooded area and a serene lake with an abundance of wildlife. Reigate is also great for travel with it being very close to Gatwick airport and the main roads A217, M23, M25, and A25 passing close by and a train service that during peak times will get you to London Bridge or Victoria in 40 minutes.